Omyn is an atom-type, but it does not have a positive, negative, or neutral charge, making it entirely different from natural atoms. Just as Earthling scientists are researching natural atoms, so Erbedian scientists have been studying the mysteries of Omyn. This field is to be called Omynology in English, and this systematic study was first established by Doctor Jofas Lorense of LORS. Omyn atoms originate on different planets and affect living organisms in different ways. Some are extremely potent, while others can’t be seen with the unaided eye—just like natural atoms. Omyn atoms are native to all the known planets except earth. There are 7 classifications of organic Omyns which modern scientists have defined to better understand Omyn atoms. These classifications group together Omyn with similar manifestations, geographical origins, and atomic structure. a class of ancient light Omyns with regenerative healing capacities in its defensive forms and light-, space-, or time-bending capacities in its offensive forms. Pure Finomuy is always present in omynuy who grow wings. The omynuy most associated with Finomuy are the Vfinom and Amesytins. Known as the "sacred light" Omyn, it actively manifests itself as vivid light with golden tones. However, it is generally only seen in dire circumstances, as it acts more as a defense mechanism or organic weapon. Finomuy traces directly to Vfinom lineage. Genetic Studies: Finomuy's natural, genetic manifestation is wing-growth and hollow bone structure in Soul-beings. Theoretically, it is a recessive Omyn which is repressed if dominant Omyns are present, meaning both parents must possess and pass on Finomuy's genetic information in order for their offspring to be winged. Therefore, not all Amesytins have wings and hollow bones, even though they all do possess Finomuy. More genetic studies are being conducted. a class of elemental Omyns which have a direct relationship with the natural and Omynic environment. Aravos: highly combustible atoms which emanate scorching heat waves and create open flames. Aresyt: atom manipulation which can form natural rock, stone, or metal by mimicking mineral compounds. Arisdis: atom manipulation which cools and heats water to the point of freezing or boiling and can draw moisture from the environment. Arogen: highly energetic atoms, similar in nature to Aravos Omyn, which can conduct, transfer, and spark electricity. Arosir: atom manipulation which conducts and exacerbates atmospheric gases using incredibly loose Omyn particles. a neutral Omyn native to Kadaun with one atomic structure. Genetic Enfamuy affects appearance, cognitive functions, and physical strength by channeling neurotransmitters throughout the brain and nervous system. It is known to enhance the saturation of elemental Omyns if present. The omynuy most associated with Enfamuy are the Senfamin and Somorrins. Enfamuy has only one atomic structure. Nevertheless, its neutral nature makes it difficult to identify, as it often blends with other Omyns. The only way to study it systematically would be to have a sample from a living Senfamin—an impossibility on Erbede, as Senfamin cannot live on its surface because of the "Senfamin Curse," a lung condition triggered by Erbede's atmospheric makeup. A condition Jofas Lorense described this way: "In simple terms, Senfamin all die because they're intolerant to air, and we have no idea why." hybrid Omyns blended from Kadaun’s ancient Omyns (Finomuy, Enfamuy, Arlomuy) that over time manifested themselves both genetically and geographically. Its 3 kinds manifest unique traits depending upon the saturation of ancient Omyns present. The omynuy most associated with Maseruy are the Amesytins, Trajonyts, Somorrins, Kinhaunins, Oranu, Onu, and Ualians. neutral, ancient Omyns which interact with organic life such as their host’s body, other people, animals, and plants more than their elemental surroundings. 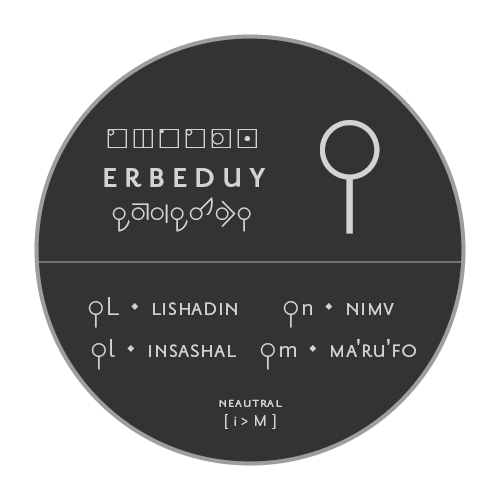 Erbeduy can cause muscle growth, emotional manipulation, prolonged lifespan, and enhanced cognitive function among other unstudied side effects. Some forms are capable of absorbing, digesting, and re-purposing Omyns from the environment or organisms surrounding them. The omynuy most associated with Erbeduy are the Nimv, Insashal, Lishadin, and Ma’ru’fo. It is also carried by Ualians, Dymo, Kinhaunians, and Shintyr. Erbeduy Omyns are difficult to study for many of the same reasons as Enfamuy. That is, not only are they neutral, but many of the Ancient Erbedians who produced them were massacred during The Great Conquest, and very few members exist today. By the (usually violent) fusion of two highly potent Omyns originating from separate planets, ie Finomuy and Erbeduy. Under both circumstances the results occupy an unidentified Omyn class with unique characteristics and features. 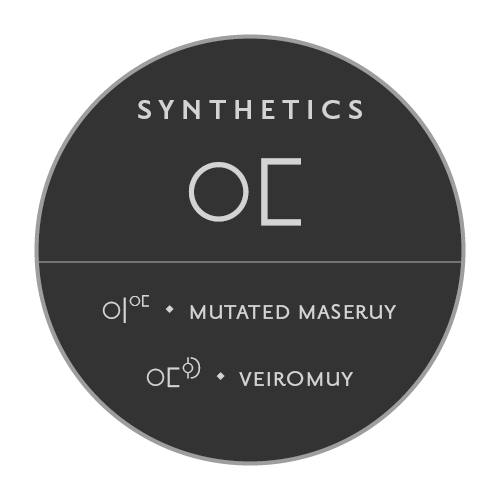 The currently known Synthetic Omyns are not race definitive. Currently at LORS, a new synthetic Omyn is being studied, but the research is not yet available to the public. an ancient parasitical Omyn from Kadaun which manifests itself in a deep purple color with extended parallel lines, circles, long curves, and swelling. The appearance of Lyphamuy varies in complexity according to saturation. 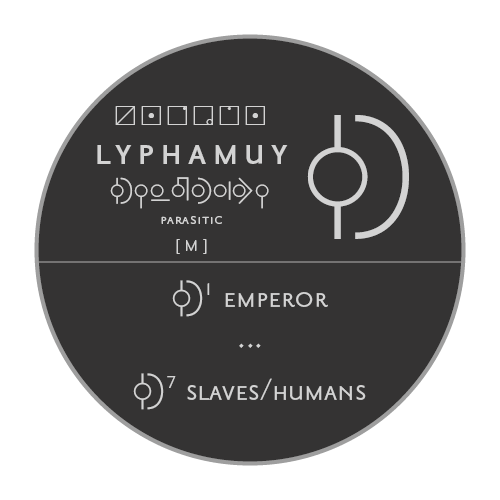 Lyphamuy is believed to be separate manifestations of one massive being, and it infects hosts according to a hierarchal scheme with seven tiers in which (1) represents the sovereign and (7) represents the basest slaves. Cultural Facts: On Erbede, the color purple isn't symbolic of royalty and wealth as it is in many Earthling cultures. In fact, it's become synonymous with evil and is associated with morbid subject matters such as death and depression. If it is linked to royalty, it's paired with dictatorship, oppression, and blinding pride. This photo is an example of the manifestation of the fourth rank, and it will grow over time as the parasite feeds off its host's genetic Omyns. When Lyphamuy is active, its pattern becomes almost black and is surrounded by a bright indigo glow. Active Lyphamuy either causes agonizing pain and deep grief to its host, or a sudden influx of physical strength, Omyn enhancement, and mental acuteness.